It is a cardinal rule of public confrontation that the flagitious adjectivisation of politics leads to hyperbole and hostility. The bilious beginning of an 18-month electoral battle has marked the year 2018. As various political parties pull up their socks and sharpen their rhetorical weaponry, the nation is heading for a major downslide in the quality of governance. This year alone would see at least half a dozen states choosing new governments, followed by at least a dozen more in 2019. Prime Minister Narendra Modi’s longest ever speeches in both Houses of Parliament last week reflected his steely resolve to savage his political opponents rather than showcasing the performance of his government during the past 45 months. Modi was at his acerbic best. His oratorical cannonade blew holes in the Nehru Parivar’s halo as he repeated his wow to bring about a Congress-mukt Bharat. To that end, he has led the BJP to demolish his bête noire in every Congress-ruled region. From barely half a dozen states under BJP rule in 2014, Modi has brought over two-thirds of the states into the saffron belt. The heavy political content of his intervention was the reassertion of the trend that the BJP’s electoral successes at both the Centre and the states are by Modi, of Modi and for Modi. Never before has any prime minister since Independence converted himself or herself into the fulcrum of the mandate sought even in tiny states like Tripura, Meghalaya and Nagaland. Modi’s modus operandi is to target state governments for frontal attacks or special praise depending on its ruling party. His eyes are now fiercely set on Karnataka, as was evident during his 100-minute speech in the Lok Sabha last week. Having wiped out the Congress from the north, west and partially the east, he is determined to win back Karnataka for the BJP so that his dream of removing the Congress from all the big states is finally achieved. Karnataka is the only one left. Like in Gujarat, he is seeking victory in his name rather than his party’s. In Gujarat, it was Modi’s aggressive and extensive campaign which brought the BJP a wafer-thin majority, which was almost threatening to slip away during the vote count after 25 years in power. His Karnataka strategy will be significantly different. It will not be a fight between the Congress and the BJP. He also claimed that the state government was notoriously known as a “10 per cent government” where a commission had to be paid to middlemen for getting official work done. 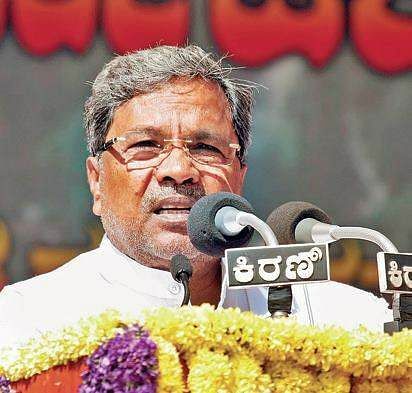 Siddaramaiah retorted, “According to me, he (Modi) is morally unfit to be Prime Minister”. He also tweeted, “I am glad PM @narendramodi is talking about corruption. I now invite him to #WalkthTalk. For a start can you 1. Appoint Lok Pal, 2. Investigate #JudgeLoya ‘s death, 3. Investigate the astronomical rise of #Jayshah, 4. Appoint an untainted person as your CM candidate? (sic).” Siddaramaiah confidently declared that the “countdown for the Prime Minister has actually begun”. BJP leaders, including former chief ministers B S Yeddyurappa, D V Sadananda Gowda and Jagdish Shettar, have taken a back seat or limited themselves to controlled aggression. Even the Union Ministers from Karnataka are confining themselves to a low-voltage campaign. Normally the BJP refrains from projecting any individual as its chief ministerial candidate. But in Karnataka it has deviated from convention by naming the controversial and tainted Yeddyurappa as its future CM. Even the informal upper limit of 75 years for holding a party or ministerial post has been waived in his case. Yet Yeddy is not being pitted against the sitting chief minister, who appears to be a much more savvy, effective and better organizer. Though he doesn’t belong to any one of the dominating Lingayat and Vokkaliga castes, Siddaramaiah has assumed a larger image than the Congress. Never before has the party depended so much on its CM than a Gandhi Parivar member to retain power. Its election leadership has shifted from 10 Janpath to the state capital. Since 2013, when Siddaramaiah took charge, the Congress vote share has been steadily rising. After the Congress polled 36.6 per cent votes in the 2013 Assembly elections, it rose to 40 per cent a year after the 2014 Lok Sabha polls. Despite a nationwide Modi wave, the Congress improved its tally to nine seats from the six it got in 2009 when the UPA’s star was on the ascendant. Siddaramaiah has also cleverly changed the narrative now. Whenever local BJP leaders target him, he deflects the criticism in such a manner that Modi becomes the talking point. Like the Prime Minister, Siddaramaiah belongs to a backward caste and comes from a humble background. According to Congress sources, Rahul Gandhi is happy to let the chief minister hog the limelight, though the Congress president would definitely hit the road intensively to counter the Prime Minister. His strategy team has already chosen titles, graphics and narratives for roadshow presentations to minimize the Modi impact. In contrast, the BJP has decided to convert Battle Karnataka into an epic combat by involving top national leaders like party president Amit Shah and Uttar Pradesh Chief Minister Yogi Adityanath to consolidate its Hindutva base. Unlike in other states, the prime minister will face a foe who will fight him on every front—dirt or development. Siddaramaiah has money and muscle power. The Karnataka verdict will decide whether a powerful chief minister and regional satrap can halt the saffron juggernaut fuelled by Modi’s charm and charisma that has been steadily steamrolling the Opposition in state after state.